There are many ways you can approach soloing on your acoustic guitar. Some are unique and creative, while other approaches, although may sound good, have been done many times before. If you’ve been soloing on your guitar for some time and struggle to come up with any technique that sounds good, or stands out from the usual stuff you hear and play, then let me introduce to you an approach that brings together two very common elements of guitar soloing. Combined, these will create very unique and amazing sounding solos on your acoustic guitar! What are these two elements? They are the open string, and the pentatonic scale. Over the course of 3 articles, I am going to show you a number of approaches you can take to create awesome sounding acoustic guitar solos using the 5 pentatonic scale patterns and opens strings on your guitar. The resulting sound will blow you away, not to mention those who hear you use this soloing technique. In todays article, part 1, we will cover the basics of this soloing approach. I will show you just how simple it really is to marry up your pentatonic scale patterns with the open strings for a totally unique and amazing solo sound. There is actually a third element I have not mentioned yet, that along with the pentatonic scale patterns and open strings, completes this unique solo guitar technique. That elements is what is known as a banjo roll. Let’s begin with the banjo roll and see how adding the elements of pentatonic scale patterns and open strings can create a totally awesome guitar solo sound for your playing. There are two kinds of banjo rolls we will be using with our acoustic guitar soloing. They are the forward banjo roll, and the backward banjo roll. A banjo roll is simply a rotating/repeating fingerpicking pattern that uses your thumb (p), index (i), and middle (m) fingers across adjacent strings. We are not going to be playing banjo rolls per se, but we will take them and apply them to the pentatonic scale. Practice each of the ascending and descending open string patterns above in isolation first so you can get them down. Slow is great for now, so don’t try and play these fast and have the accuracy of what you are playing suffer as a result. Watch the video for a demonstration of this. Before we get into this acoustic solo technique, a quick note to let you know this approach will work better in some keys than others. This is because we are using open strings. The more open string notes that exist within a key, the better that key is suited for soloing using this technique. Therefore Em is a great key for this technique for soloing. Another great key is Am. However there are keys that aren’t suited too. There are ways around this, but for now let’s stay on topic. Now it’s time to apply our banjo roll patterns to the pentatonic scale to create the foundation for this solo guitar approach. I’m going to use pattern 3 in the key of Em to run you through this technique. Nothing too unique here just yet. However, if we apply our banjo roll pattern to this scale pattern, everything changes! It’s like adding that magic ingredient that makes the dish. The great thing about this solo technique is that it is a consistent pattern. Once you get the first 3 notes down, it’s all repetition from there. 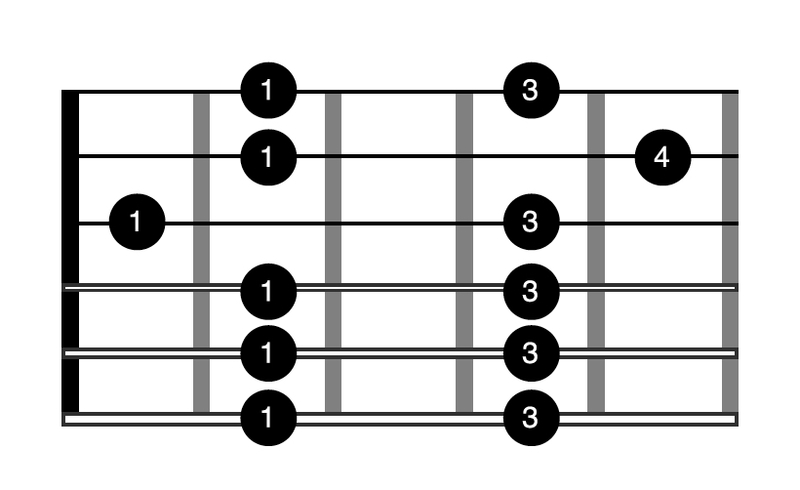 The sequence is made up of playing 2 consecutive fretted notes on adjacent strings of the pattern, followed by an open string. To descend the pattern you simply play what you have just done, only backward. Watch the video that accompanies this article for a detailed demonstration of the open string solo technique being applied to pattern 3. There is one thing left we need to do to make for a smooth switch from ascending the pattern to descending. It’s very simple, but makes all the difference. When you arrive at the 2nd string ascending the scale, you will of course not have enough strings left to complete a rotation of the forward banjo roll. This is why we stopped at the 3, 2, 1 string set when ascending the pattern above. You now have the foundation for this very unique and creative solo technique. I would highly recommend you find a backing track in the key of Em, or G Major as this is relative to Em, and practice playing and creating with this soloing approach. In the next article we will dig a little deeper into this soloing style in the context of the blues.